Fanatics.com is ringing in the New Year with their LARGEST CLEARANCE EVENT EVER! Right now, you can take advantage of discounts ranging from 30% - 60%. It's the perfect time to gear up for the NFL Playoffs and prepare for Spring Training. 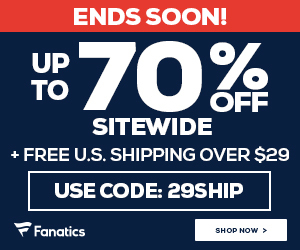 Visit Fanatics.com and click on your favorite team(s) to see what's on sale. If you spend over $50, use promo code 50SHIP to get FREE SHIPPING.